Sicilian Stuffed Pork Chops with White Wine and Caper Sauce are an elegant way to dress up a dinnertime staple–the pork chop! 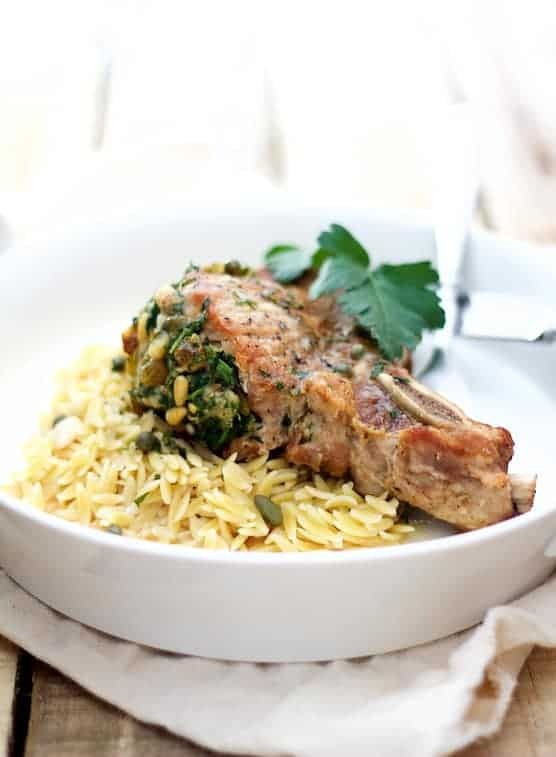 In this tasty Sicilian Stuffed Pork Chops with White Wine and Caper Sauce, pork rib chops (also referred to as pork rib-eye chops) are stuffed with a Sicilian-inspired combination of spinach, garlic, toasted pine nuts, raisins, Parmesan cheese, breadcrumbs and crushed red pepper flakes and then braised. This recipe is inspired by one in The All New Good Housekeeping Cookbook published in 2001. I recall buying it at Costco shortly after I began my personal chef business. It’s one of those great cookbooks you always reach for when you need a good tried-and-true, basic or classic recipe like these stuffed pork chops. You could use any cooked leafy green in the filling such as spinach, kale or Swiss chard, but frozen chopped spinach is a great convenience product. Start with one cup fully frozen spinach. Thaw in the microwave, but do not squeeze the water out. The water that is released from the spinach is required to moisten the breadcrumbs to help bind the filling. To lightly toast the pine nuts, place them in a small dry skillet on the stovetop over medium-high heat. They’re small and can burn easily so keep an eye on them and shake the pan frequently. When they become slightly aromatic and begin to brown, take them off the heat. After filling and browning the chops, you could simply place them in the oven to finish cooking through to the safe temperature of 145 degrees and then prepare the white wine and caper sauce on the stovetop. However, I don’t recommend this because pork chops have a tendency to be dry. A stuffed pork chop will dry out even more because the center of the filling needs to reach 145 degrees. This means the pork itself will be overcooked. Pork chops can also be braised, a slow cooking method that uses moist heat to tenderize tough cuts of meat. I like to use a cooking vessel where the chops fit snugly together as I don’t use a lot of liquid to braise these chops. If fully immersed, the filling will loosen up too much and come out of the chops. (A small amount of the filling will escape due to the chops shrinking slightly.) To reduce evaporation of the sauce, I place a piece of aluminum foil or parchment paper over the pan first, then put the lid on the pot. Turn the chops once to ensure even cooking. Capers add a nice salty bite to this stuffed pork chop dish and a little butter swirled in at the end adds body to the sauce. If you desire a thicker sauce, mix a teaspoon or two of all-purpose flour into the butter before adding it. A simple side dish of plain, hot cooked orzo pasta is the perfect way to soak up this tasty sauce. A green veggie or side salad is all you need to complete this tasty meal! Cut a pocket in the chop about 3-4 inches long and almost as far as the bone. Season inside and outside with salt and black pepper. Thaw spinach in a glass bowl in the microwave but do not squeeze the water from it. (Let cool if it’s steaming.) Add 2 cloves minced garlic, pine nuts, raisins, cheese, breadcrumbs and crushed red pepper flakes. Season with salt and black pepper to taste. Stuff even amounts of the filling into the pocket of the pork chop. Secure with toothpicks. Heat olive oil and 1 tablespoon butter over medium-high heat in an oven-safe skillet, sauté pan or Dutch oven. Brown the chops 2-3 minutes per side or until nicely browned. Transfer to a plate. Add the wine to pan, bring to a boil and scrape up any browned bits. Add chicken broth and sliced garlic and bring back to a simmer. Place chops back in the pan, cover securely and bake 1 hour or until chops are tender, turning once. Stir in remaining butter and capers. Serve chops over hot cooked orzo pasta and drizzle with pan sauce. MAKE-AHEAD: Stuff the pork chops up to the point of browning and braising one day ahead. FREEZER-FRIENDLY: Double the amount of sauce/braising liquid and cook the pork chops per the recipe. Cool thoroughly then place in an airtight container. Freeze up to three months. Thaw in the refrigerator and thoroughly heat through to 165 degrees in the center of the filling. 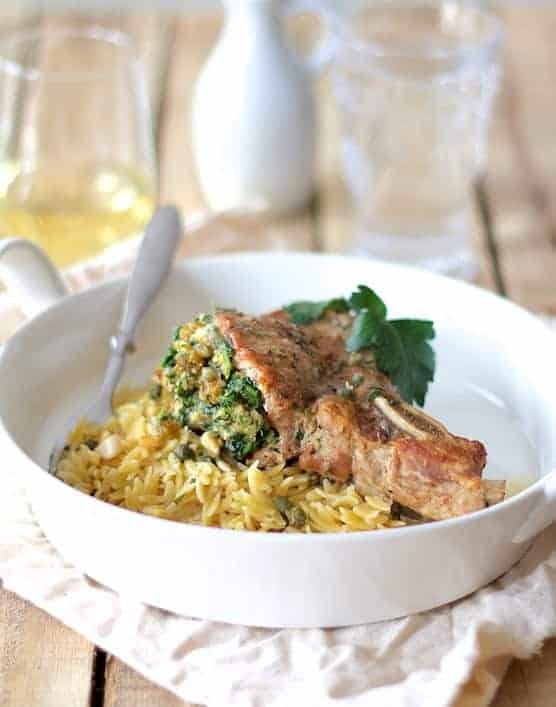 Recently I have convinced my hubby to eat more pork and am sure he’ll love me to make this! Delicious food and gorgeous photography, wow! Love your suggestions for alternative greens and cooking methods. Love the flavors of the stuffing. I’ve done a stuffed lamb chop recipe from eons ago in Sunset with pine nuts and blue cheese – a show stopper!!! I need more pork in my life! These look fabulous! 200 recipes and I don’t think I have one single Pork Chop blog……must change that! Thalia, You are always so kind! Your photography and recipes are so gorgeous I practically tear up! I don’t cook pork chops enough and after seeing this post, you definitely have inspired me to make them. These Sicilian stuffed pork chops look seriously yummy.